You will be able to make the most of all the great savings and offers below. Only $49 for 2 years, the benefits and savings start from the very first day you join the TOP 10 Club. As a TOP 10 Club Member, not only will you save money, you'll enjoy additional benefits while staying at TOP 10 Holiday Parks. Membership can be purchased when you book online, as part of your accommodation or site booking. Simply click the "book now" button and start saving. 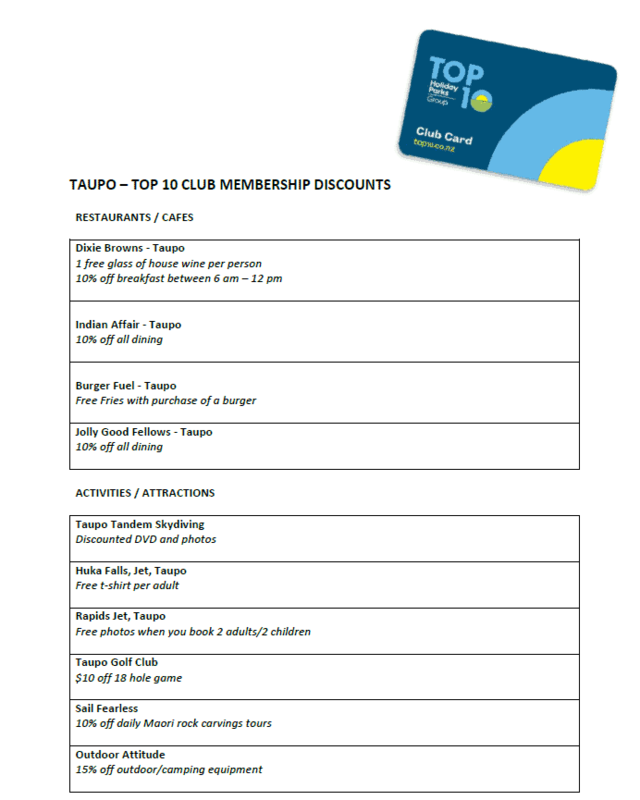 Enjoy the many local attractions and eateries that Taupo, Turangi and the local area has to offer with special rates for Top 10 Members. Click on the link below for more details.